Clay Aiken could have actually won something yesterday. But then he didn’t. In North Carolina’s 2nd Congressional District, Republican incumbent Renee Ellmers retained her post for another two years, defeating challenger Clay Aiken 59 percent to 41 percent. Why did Aiken lose? Much of that answer surely lies in a mix of social and political issues. And then there’s the reality that Aiken is a loser. A well-documented, extremely consistent loser. 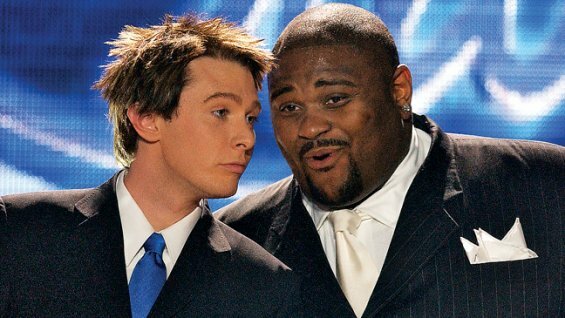 In 2003, he was the runner-up to Ruben Studdard in the second season of American Idol. In 2012, he was the runner-up to Arsenio Hall on the fifth season of Celebrity Apprentice. And yesterday, he was the runner-up (last place) in the general election for the North Carolina 2nd Congressional seat. He’s a loser, in the most literal sense, not in the slang, Beck-inspired, not-cool way. Clay Aiken is a loser because he does not win. He’s not a winner. The thing about being a loser is that it implies very little about your character and your overall worth. Being a loser exists on a separate plane than most human quality attributes. Many a terrible person is a winner, an inspirational figure, or a leader. So, again, being a loser simply implies one is not (or no longer is) capable of winning. That’s all. But should you be embarrassed and ashamed of your existence as a loser? Absolutely. Because you’re a loser. I know Aiken’s a loser, because I can spot a loser. Because I’m a loser. Even after experiencing some degree of success in my life, thinking I’m moderately cool and publicly very into my wardrobe right now, I’m still very much aware that I am a loser. I’ve embraced that. Because I’ve tricked myself into believing winning isn’t everything. Clay Aiken has so much going for him. He’s rich, he’s famous, he’s respected in many circles, and obviously people like him, considering the almost 85,000 votes he gathered on November 4. You can be all of that and still be a loser. Which Clay Aiken very much is. Losers deserve respect, when losers act accordingly. And are self-aware. And understand where they are wanted, where they are needed, and where they are not allowed. Because if there’s one thing a loser needs to know about his or herself, it’s that they are a loser. Clay Aiken does not seem to understand that Clay Aiken is a loser. He’s aware that he has lost many times. But he is not embracing what it means to be a loser. Because if he had, the news that trickled out in the past 12 hours, following his loss, would not exist. Self-aware losers understand that their story isn’t the most important story. Admirable losers don’t write memoirs, while insufferable losers think that people want more — an inherently flawed conceit. Because implicit in the act of losing is not being celebrated, not being the focus, and ultimately disappearing. It’s a cultural epidemic, the loser never going away. And it’s not just Aiken; it’s everyone and everything. Television reboots of bad shows, sequels to tired films, washed-up athletes becoming even more washed-up commentators, terrible actors becoming television hosts of terrible shows, non-dancers suddenly dancing — it’s getting to a point when we’ll tolerate, prop up, and celebrate anything that we’ve ever heard of. And so the culture is becoming increasingly filled with losers getting more opportunities to be losers. According to Matt Hanna, the Esquire Network’s head of programming, the Clay Aiken docuseries “is a raw and honest look at American politics through an incredibly unique and compelling candidate.” That quote could apply to 1994’s The War Room, a movie about a great underdog win, or even 2014’s Mitt, a film about a winner becoming a loser. Because there’s something compelling about a great rise or a fall from grace. Because both imply, at one point, that a winner was involved. And then there’s a film about consistent and predictable losing, from someone who always loses, announced moments after a loss. It’s not provocative. It’s lazy. And it suggests that any story that can be told should be told. Which is not true. The saying goes, “Losing builds character.” Fewer statements are more true. But letting a loser temporarily win for losing is inauthentic. Because that ignores a seminal truth: You lost. And none of this even acknowledges that this stinks of a reality star becoming a politician to then become reality star again, thus undermining the declarations about a desire to exist in a non-reality show space. Rembert Browne is a staff writer for Grantland.